Looking at paintings, people often seem to want an answer to the question, "How long did it take you to do that?" It’s difficult to offer a reply. I can work out the hours I spend in the studio at an easel, applying media to a surface, but that would only give part of an answer. I could add to that, a drive of five hours to Co. Durham; followed by four hours on a beach, looking, disseminating information and refining an idea (should you be blessed with one). Time waiting for the right conditions (should you ever get them), then return to sketch for a few hours more. Add a return journey of five hours, and a few hours for working out ideas, stretching paper, collating materials and then tot up the hours working on the final piece, (which may or may not come to anything). If it does come to something, you have a piece of paper in your studio, which then has to be presented, and you hope, be sold – add an indeterminate number of hours more for that, resulting in an annual pay that probably falls short of Craig Gardner’s daily rate as a premier league footballer; and he’s often not very good at that. Oh yes, add the lifetime it took you to get into a position to be able to do it. The only reason I am whining on like this, is because an interesting situation came to me this year where I found myself replying, ‘Just over 40 years’ to the original question. 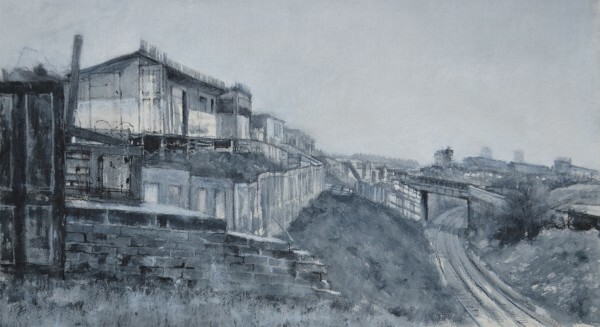 The reply was with tongue in cheek, but it did beg a further question: ‘Is it possible to take over 40 years to complete a painting?’ In the early 70s I made thin sketches of places that were meaningful to me. I had a strong feeling for those places, and I visited them many times; they were my ‘other worlds’ that helped me feel expansive, but it was also a frustrating time, as my visual language was not very well developed and my craft still unrefined. Much practice was needed. When that was achieved to some degree, those places were no longer convenient to me; I had moved my home, but I did re-visit them from time to time. My attention had become absorbed by other places, and my drawings and paintings focused on many trips to India, Scandinavia, Greece and my new home in Oxford. I still had a deep passion for those early places, my ‘other worlds’, many years later. So, I went back with a clear head, and focused my attention on drawing them. I had wondered if those feelings would have passed me by. Could I still feel the situation? And would I regret not being able to express those feelings at the time? What I found was that the places had changed greatly, but there was something constant there, and it is something that I have found all over the world. What I found to be constant is that each place has its own light and its own air. 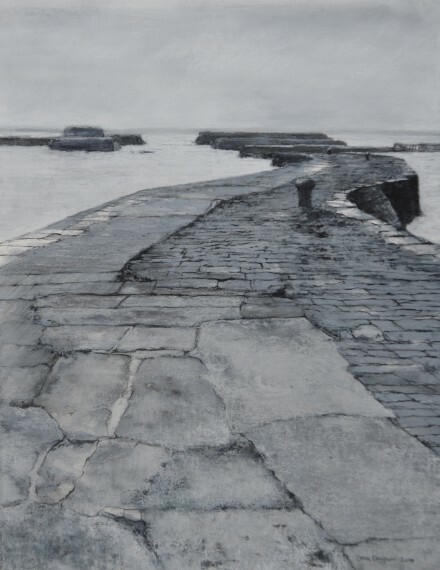 This makes it different to other places, and it affects a place’s colour, its tonality, its texture and it goes towards determining the way you might feel about it. These responses make it unique. Occasionally they may visit you, like a thought does, whilst you are in another place –it can catch you unaware. The moment may be insignificant; you may be putting the bins out on a grey day, and a breeze brushes your cheek – so transporting you to another time and place. It happened to me recently. The light was soft - an even grey that some may call ‘dull’, and there was a stiff breeze carrying the distant sounds of children playing in a not-so-far-off school. It took me to Sunderland in 1978 – waiting for a coach to take us, a group of architects and planners, to a behind-the-scenes visit of Durham Cathedral. The weather conditions were similar, the light was similar and the air was similar. We were standing at a spot overlooking the town, and all it’s muted sounds drifted towards us. There was melancholy in the situation, a melancholy that was held in a moment isolated from a transient life. I don’t know why those feelings should have visited me at that time, but the point is that what I was feeling was very specific to that time and place – Sunderland, April 1978. I can’t begin to explain this, I only know that it happens; and to me, I am pleased to say that it happens quite often. ‘What has this got to do with drawing?’ I hear you say. Well, in the context of these particular drawings, quite a lot. In re-visiting these places, the responses you may have felt on a previous occasion can also be re-visited – that ‘isolated moment of melancholy’ - if they were strong enough at the time, and if they remain within you. Dawdon Colliery used to be a pit village; it lies just to the north of Easington Colliery in County Durham – the place where ‘Billy Elliot’ was filmed, and also the place that drove me nuts in the 1970s. 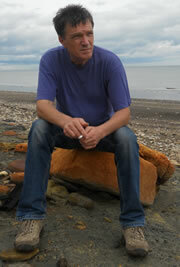 It did so out of frustration - little to do with Easington, which was a place I liked, and more to do with my position. I was working at the District Council as a landscape architect; a new profession, that was trying, amongst many other things, to encourage the Parks Department to use botanical names. It was something I was in favour of, for several reasons. The established labourers, understandably, were not. I would never refer to botanical names in conversation with them, but I always used them on design drawings. In a site cabin, during a tea break, one of them asked me why I was wearing a copper bracelet. "Desperate measures", I said. "I’ve got something called Ankylosyn spondilitis." He looked at me, slowly sipping his tea, and replied, "Haven’t wa just planted some of them in the King’s Head car park, son?" I have a lot of fond memories of times in that office, and enjoyed such moments of conflict expressed in such a subtle way and with good humour. I have other memories, that I found utterly frustrating, those that would throw me into a more serious personal conflict. One morning I was in disagreement over ‘tidying up’ an area of allotments. The Council considered this was necessary because they could be seen from the main road –it was something I saw as part of a society’s obsession with neatness – a suburbanization of the rural fringe. 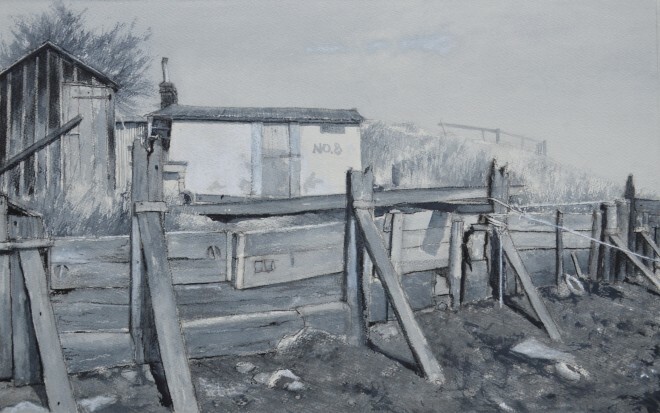 The supposed unsightly borders of old doors, bed-heads, bits of leftover plywood etc., that formed the fences of the allotments were to be swept away in favour of a neat fence in a straight line, with a sharply edged path running alongside it. To me it meant the destruction of something of great visual interest, something of character, something that contained many an untold story, something that would attract me as a subject to paint, in favour of something that satisfies this fashion for bland neatness. I was being asked to be part of this, and I could not put my heart into it. I later returned to my office to witness a petty squabble over someone taking a haircut in ‘work’s time’, and at the tender age of 25 I began to wonder what my life had become. I couldn’t wait until the lunch break to escape what was becoming a depressing realisation; this is where Dawdon colliery comes in - I contrived a site visit, got into my car and drove there. sketchbook entry, Dawdon colliery 1977. 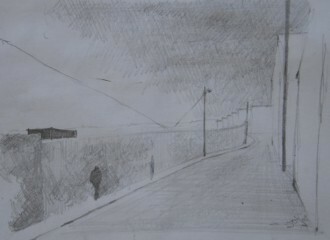 I sketched the streets leading towards the pit-head. In making this sketch I could leave everything the office had thrown up that morning, behind me. I was content, I was focused, and I felt a heightening of all the senses the morning had been grinding down. There was now a good reason for being where I was, and for doing what I was doing. This was my solace. I was probably there one and a half hours; it seemed like a lot longer, for the sketching is what I remember of the day. Returning to the office, I began to think that I had chosen the wrong profession. As you might imagine, there were other such occasions, and I sketched the same spot again, in the snow, and later reversed the image in preparation for an etching, which I never got around to doing. This ‘isolated moment of melancholy’ remains with me. It was a poignant moment, one of viewing circumstance from the edge, or from the outside. 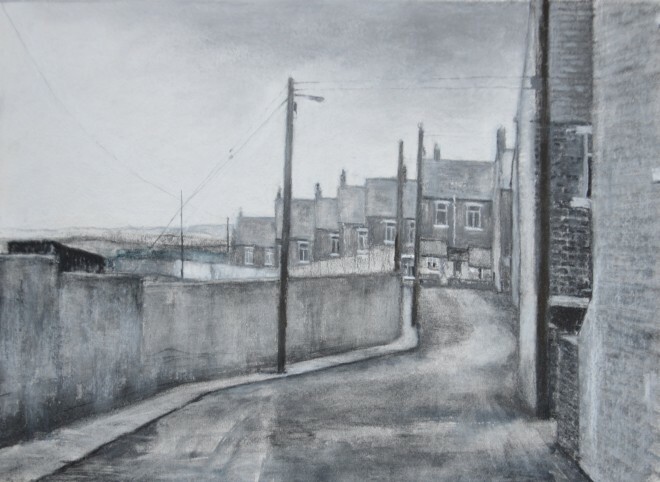 That street in Dawdon was empty, as I imagined the men hewing coal, the women at home ironing or cooking, and the children all at school – following the more clearly defined roles of the era. Towards the pit-head, Dawdon Colliery 2014. It was some 36 years later that I re-visited Dawdon and used these sketches, to make the drawing I didn’t make at the time. The moment was still in me, and crucially, the urge, the impetus, the fire, was still there to enable me to make the drawing. That moment had never gone away, and my desire to express it had never properly been fulfilled – until now. There are several other examples of this. I will show them to you, sparing you the details of my life that go with it, even though they too were as fresh as the visual recollections that enabled me to make the drawing. They seem to go hand in hand. This is Sunderland in 1979. Moving from Easington District to Sunderland Borough Council was a move from the frying pan into the fire, for someone with my outlook. Escaping another office, I found myself by a set of allotments bounded by those old doors etc. that I was being asked to sweep away in my previous employ. They contained the structures so characteristic of the North East, known locally as pigeon crees (lofts). The branch line to Hylton Colliery swept by the perimeter. The circumstances were similar to those at Easington, and another moment contained was finally expressed. Fog on the Wear 2014. In my initial blog ‘Run for Home’, I referred to ‘Fog on the Tyne’ as being a regional anthem. Many people living in Sunderland may not consider this so. They understandably often feel overshadowed by their more illustrious neighbour, Newcastle- upon-Tyne. I don’t share in this unhelpful conflict (except on occasions when the ‘Mackems’ take on the’ Toon’ at football), as I can enjoy what both places have to offer. 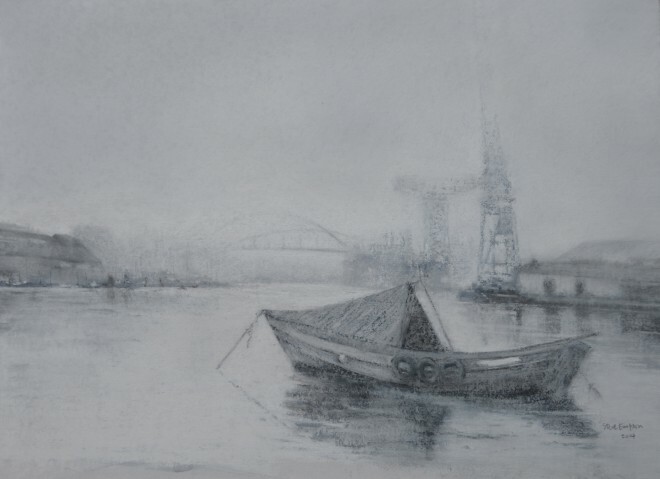 My meagre attempt to redress the balance towards Sunderland is to title this drawing ‘Fog on the Wear’. It is another example of a moment lying dormant for 35 years. Before experiencing life in the wider world of the Durham pit villages, I still had my own special places. The West Harbour in Hartlepool was one of them. The place has now lost its texture. Worn-smooth setts and stones were discarded in favour of sharp-edged concrete, crossed with zinc-coated railings. My memory of the original materials returned vividly, as did the texture of the sounds and smells, as I tackled this drawing. There was a fleet of small-craft berthed here, their rigging whipping against their masts; their owners hammering and sawing from sheds on the adjacent shore. The nearby workshops rang with the clatter of metal on metal and gulls screeched. The taste of salt penetrated the nose and throat; there was the scent of diesel on the nose and workshop dust from the stripping of ships’ boilers coated the sketchpad and the lungs. 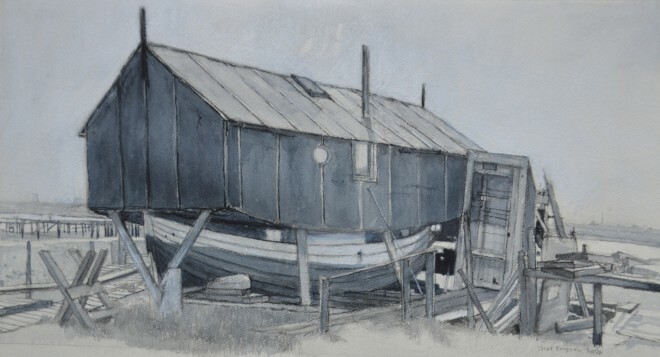 I have mentioned the two following drawings in a recent post ‘Greatham Creek’, so I won’t repeat myself here. Houseboat Greatham Creek 2014. 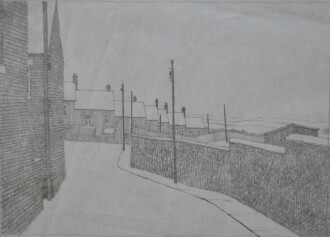 I simply include them because they are further examples of what I am talking about – drawings completed some 42 years after making the initial sketches. Mac's Island Greatham Creek 2014. I am happy that I have finally completed them, and can turn my attention back to those things I continue to discover. It has been an interesting project to work on these six drawings. At the same time I have re-visited so much of myself. The same places continue to give, and although they are vastly changed, there is something that remains constant . . . . . . . . . . . . . . . . .